TALLAHASSEE, Fla. – Today, Governor Scott and Cabinet approved the purchase of a conservation easement over approximately 19,225 acres in Dixie County within the Lower Suwannee River and Gulf Watershed Florida Forever project. Purchase of this easement will result in the protection of the natural resources located around the Suwannee River and the Gulf of Mexico — providing habitat and corridors for rare plants and animals to be protected over a wide span of undeveloped public lands. This conservation easement will permanently protect from development while allowing the landowner, The Lyme Timber Company LP, to sustainably harvest timber — ensuring important forestry jobs stay in the community. Forestry, fishing, hunting and agricultural support industries are the backbone of Dixie County and serve as the economic basis of the region. Ecotourism will also flourish by conserving the waters in which people swim, fish, scallop and boat. The conservation linkage garners support from a multitude of conservation advocates. “This project is critical to the health of the Lower Suwannee River and the Gulf of Mexico and will help increase coastal resiliency during major storm events. We are honored to partner with the Lyme Timber Company and the Florida Department of Environmental Protection on this truly unique landscape-level effort, that helps provide clean air and water, wildlife habitat, jobs and economic benefits to communities in Florida’s Big Bend,” said Lauren Day, Field Representative of the nonprofit Conservation Fund. “The health of our coastal waters and their habitats depend upon the choices we make inland. 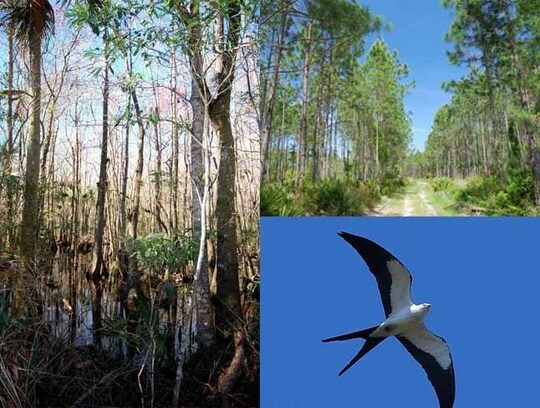 This project is a savvy investment in the future of the Big Bend’s forests and coastal areas, making them more resilient in the face of a changing climate,” said Julie Wraithmell, Executive Director of Audubon Florida.